I LOVE that I am turning 30 in The Year of the Pig. 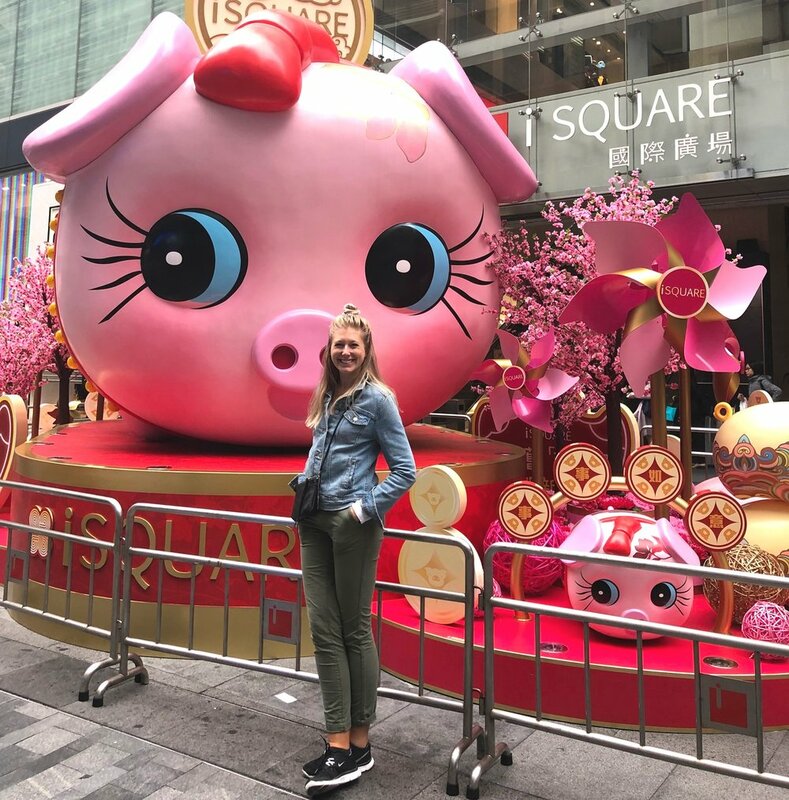 Here I am in Honk Kong with the Piggies! Happy Friday! No frugality post today because we have something somber to discuss. I am officially an adult. The happy carefree days of my WiLd 20s are behind me and a life of adulting looms before me like an alpine objective. Have you ever set out to climb something like a 14er or big ski objective, something that requires you to start early? Like 2-3 am early. You are walking in the dark congratulating yourself on being awake and moving, and only slightly considering turning around to crawl back into your sleeping bag. But you push on like the courageous warrior you are. You have been moving for a few hours when the sun peeks over the horizon. Suddenly instead of only being able to see what your headlamp illuminates - your next step, your simple task, the only thing you have to accomplish in that moment, to keep moving. Now you can see the entire valley and the false summit far far above you that you know isn’t even close to how far you actually have to go. This is how I feel about turning 30. I am glad I have been moving, I am glad I have been up and working, but suddenly it is all to clear to me just how much I haven’t done. These lists usually include things like own a home, have a certain net worth, be in the career you want to be in. Even the more “fun” lists of bucket list items you should do before 30 that have items like live in another country, learn another language, or visit every continent leave me feeling less than. There is a sense that the time to have fun is over, if you didn’t get it done in your 20s, it’s too late. Expectation: You are 30, you should be at an advanced place in your career and know what you want to do and where you want to be in 5 and 10 years. Reality: I just finished my first year of actually practicing law and am junior as a junior attorney gets. I don’t have the litigation skills I want to. My writing isn’t as good as I would like it to be. I have earned half of what I “could” for my entire career and I have no clue what my next step is or what I want to do. Expectation: You are 30, you should have children, your ovaries are dying. Reality: I am not planning on trying to have children any time soon. I am terrified that I will be infertile. If trying to conceive is difficult or something goes wrong, I have no doubt that I will blame myself and my selfish ancient eggs. But, I don’t want a baby right now. Expectation: You will own a house. Reality: Yes, I own a house. Actually the bank owns most of the house. I only “own” a home because my parents gifted me the down payment. I otherwise would have not been in any position to buy a home. Expectation: You will be married. Reality: I can’t pretend like turning 30 isn’t easier because I have this one checked off. I lucked out and found someone who can tolerate me who I love dearly. This isn’t because I did anything extra or I am special. It happened to work out. Expectation: You should have a net worth that makes you a high accumulator of wealth according to “The Millionaire Next Door” equation. First, everyone should read this book. The authors lay out this formula for determining whether you are on track with your net worth: Multiply your age times your pretax annual household income from all sources except inheritances. Divide by 10. This, less any inherited wealth, is what your net worth should be. In short: Age x Household Income / 10 = target net worth. Reality: LOL NOT EVEN CLOSE. Are there good things about getting older and being in my 30s? Absolutely. I have more experience - I am (hopefully) better at my job and will have more authority the older I get - I have more resources to do things that I care about. There are a lot of good things about getting older, but this milestone comes with baggage. Maybe they all do? But hey, maybe this is the year people at work stop asking me how my internship is going! If you too are not hitting the arbitrary markers society throws at you for your age, remember that society is boring. There is more than one way to skin this cat. I am glad I am out of my sleeping bag and have been walking for a few hours.